For today’s Friday Favorites, I’m happy to feature the Pilgrim Story Hour with Mony Dojeiji. This is a series of video and audio podcasts dedicated to sharing stories about the Camino experience. 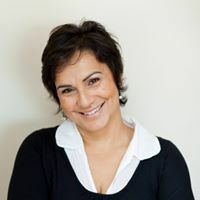 Mony begins each episode with a story of her own based on a particular theme, then she invites online participants to join in and share theirs. She is a master storyteller and speaks authentically on a variety of Camino topics, such as rituals, animal encounters, trusting a stranger, walking alone, and courage. You can find The Pilgrim Story Hour on a variety of platforms. If Mony’s name sounds familiar, she wrote a guest post about her remarkable story, Love revealed itself when I wasn’t looking. Mony Dojeiji and Alberto Agraso are the authors of the international award-winning memoir Walking for Peace, an Inner Journey detailing their 3500-mile, 13-country, 13-month pilgrimage from Rome to Jerusalem. For more information about their journey, please visit their website www.walkingforpeace.com. The Pilgrim Story Hour is featured on my Camino Resources page, and on my Favorite Camino Blogs page. Give it a listen next time you need a Camino fix! Thanks so much for sharing our story and journey! It’s an honor to be featured.